Water is the most basic and essential element in sustaining life. Uninterrupted supply of water upon demand is the most basic requirement to ensure high quality of life. The Solar PV panels convert the abundant solar energy available into clean/green electricity. This DC current generated is then fed to YE Solar Pump controller, which either converts the current to AC or uses as DC to run the AC/DC pump respectively. The pump can be either submersible (as shown in Pic) or surface pump. 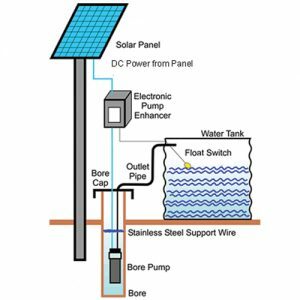 YE solar pumping system can be used for pumps ranging from 0.5 HP to about 20 HP, covering virtually all applications. Systems can be configured such that during the day, sufficient water is pumped out to meet the requirements.